was founded in Fullerton, California by Clarence Leonidas “Leo” Fender in 1946. 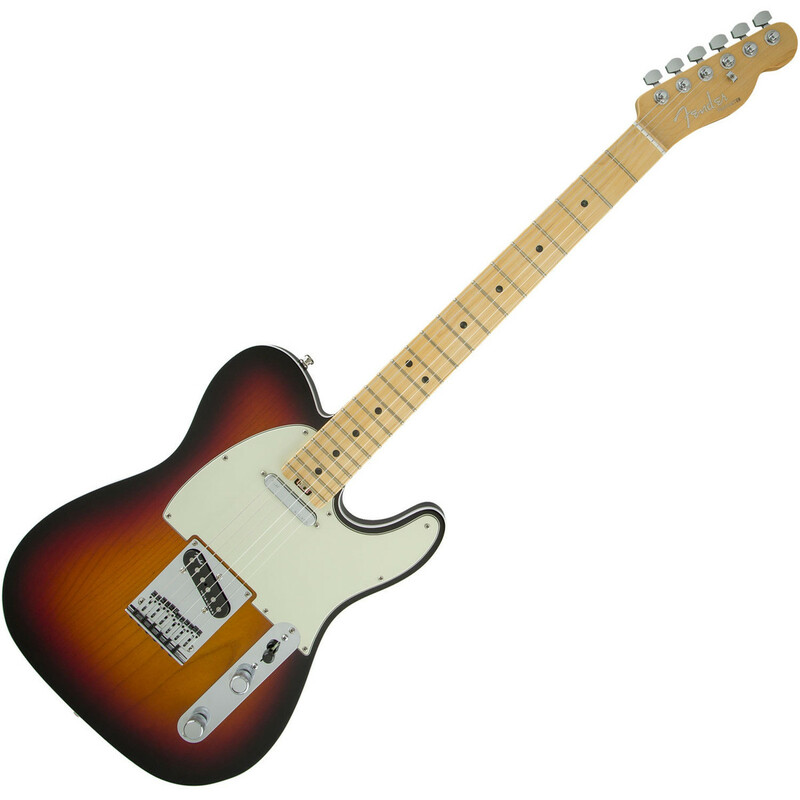 In 1950, Fender introduced the first mass-produced solid-body electric guitar, the Telecaster (or Tele). Following its success, Fender created the first electric bass, the Precision (or P-Bass). In 1954, Fender unveiled the Stratocaster (or Strat) guitar. With the Telecaster and Precision Bass having been on the market for some time, Leo Fender was able to incorporate input from working musicians into the design, such as the Strat’s comfortable contoured edges and in-built vibrato system which led to its soaring popularity. The Fender Telecaster,was the world’s first commercially successful solid body electric guitar. Its simple yet effective design and revolutionary sound broke ground and set trends in electric guitar manufacturing and popular music. Introduced for national distribution in the autumn of 1950, it was the first guitar of its kind manufactured on a substantial scale and has been in continuous production in one form or another since its first incarnation. The Fender Stratocaster is a model of electric guitar designed in 1954 by Leo Fender, Bill Cargson, George Fullerton, and Freddie Tavares. 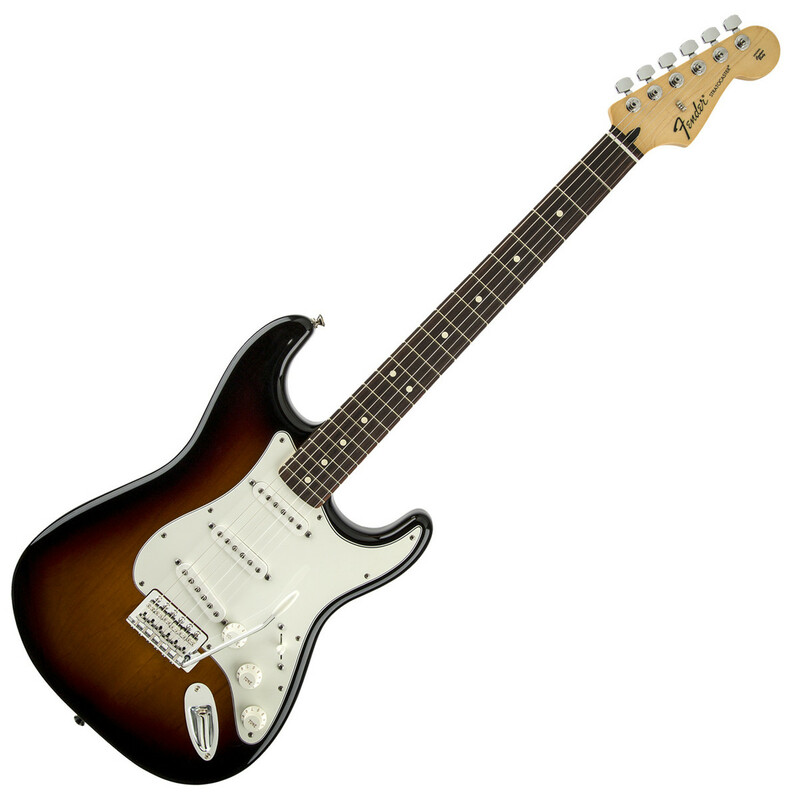 Fender has continuously manufactured the Stratocaster from 1954 to the present. It is a double-cutaway guitar, with an extended top “horn” shape for balance. Along with the Gibson Les Paul and Telecaster, it is one of the most copied electric guitar shapes. The Stratocaster is a very versatile guitar, usable for most styles of music and has been used in many genres, including country, reggae, rock, pop, folk, soul, RnB, blues, jazz, punk, and heavy metal. The Fender Jazzmaster is an electric guitar designed as a more expensive sibling to the Fender stratocaster. First introduced in 1959, it was initially marketed to jazz guitarists, but found favor among surf rock guitarists in the early 1960s. Its appearance is similar to the jaguar, though it is tonally and physically different in many technical ways. The Fender Jaguar is an electric guitar by Fender characterised by its offset shape, a relatively unusual switching system with two separate circuits for lead and rhythm, and a medium-scale 24″ neck. 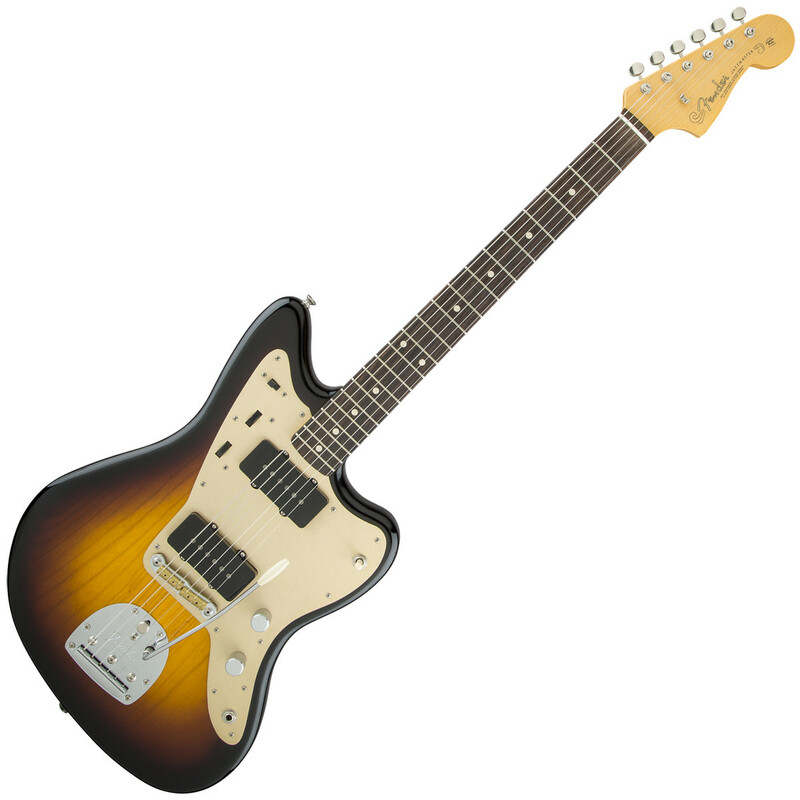 Owing some roots to the Jazzmaster, it was introduced in 1962 as Fender’s top-of-the-line model. 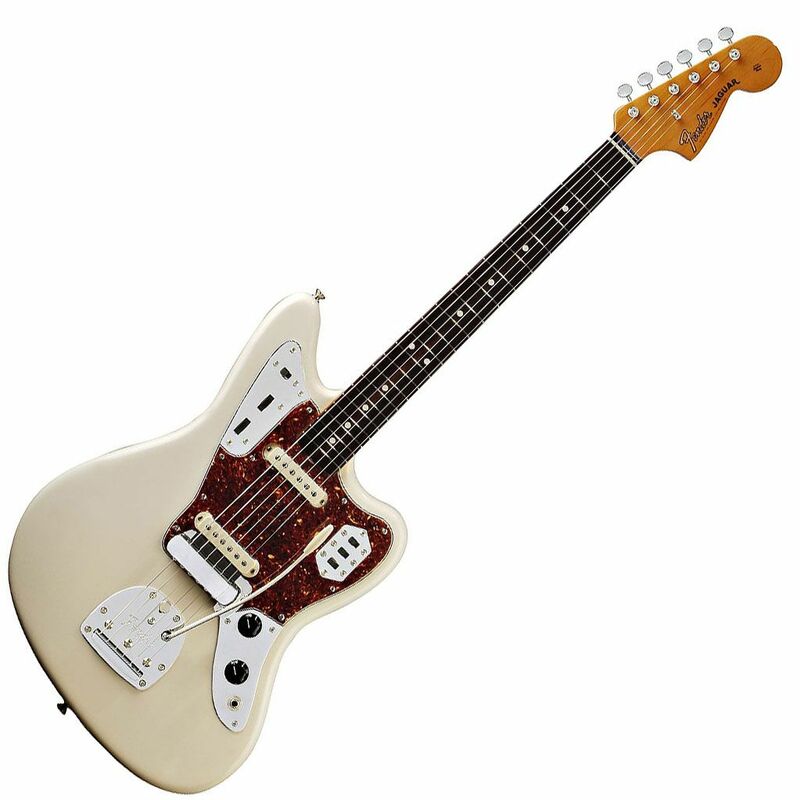 During its initial 13-year production run, the Jaguar achieved its most noticeable popularity in the surf music scene. After the Jaguar was taken out of production in 1975, vintage Jaguars became popular first with American punk players, and then more so during the alternative, shoegazing and indie rock movements of the 1980s and 1990s. Fender began making a version in Japan in the mid-1980s, and then introduced a USA-made reissue in 1999. Since then, Fender has made a variety of Jaguars. The Fender Mustang is an electric guitar that was introduced in 1964 as the basis of a major redesign of Fender’s student models, the Musicmaster and Duo-sonic. It was produced until 1982 and reissued in 1990. In the 1990s, the Mustang attained cult status largely as a result of its use by a number of alternative rock bands. Early examples are generally seen as the most collectible of all the short-scale Fender guitars. The Mustang features two single-coil pickups, an unusual pickup switching configuration, and a unique vibrato system. It was originally available in two scale lengths (24 or 22.5 in). The Precision Bass (or P-Bass) is a bass guitar manufactured by Fender. In its stock configuration the Precision Bass is a solid body, four-stringed instrument equipped with a single split-coil hum-bucking pickup and a one-piece, 20 fret maple neck with rosewood or maple fingerboard. it came about because the double bass is difficult to transport and it was also becoming hard to hear in large bands or those that used amplified instruments and it requires skill to play such that it can not be readily picked up by any guitarist. Its prototype, designed by Leo Fender in 1950, was brought to market in 1951. it was the first electric bass and remains among the best-selling and most-imitated electric basses effecting the sound of popular music ever since. The Jazz Bass (or J Bass) is the second model of electric bass created by Leo Fender. It is distinct from the P bass in that its tone is brighter and richer in the midrange and treble. It has a more focused tone than the Precision Bass, with less low end and low midrange. Because of these tonal characteristics, the Jazz Bass is often preferred by bass players who seek a more noticeable sound, rather than serving as a background instrument. The sound of the Jazz Bass has been fundamental in the development of signature sounds in certain musical genres, such as funk, disco, reggae, blues, prog rock, heavy metal and jazz fusion. Introduced in 1966 as a companion to Fender’s shorter-scaled, two-pickup Fender Mustang guitars. 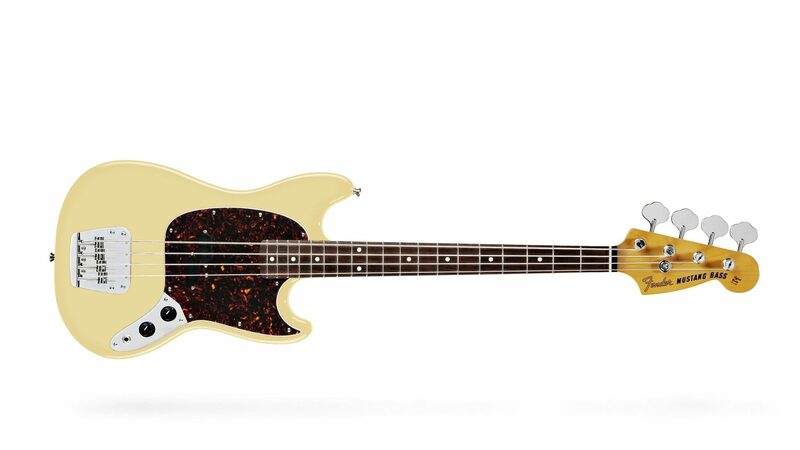 The Mustang Bass has a short 30″ scale and a single split pickup (similar to the P Bass), one volume and one tone control, with strings-through-body routing. The standard finishes were red and white. Mustang Basses, like all Fender guitars, were finished in nitrocellulose lacquer up until 1968, thereafter in thick polyester finish. In 1969, both the Mustang guitar and bass were issued with ‘Competition’ finishes. The yellowing of the lacquer on some early models has also resulted in “rare” colours like Surf Green, in reality a yellowed Competition Blue. If you have any more information about Fender’s history then do not be shy to contact us.